Posted on February 24, 2013 by admin in Blog, Infos. The Allenby Bridge, also known as King Hussein Bridge, is one of 3 border crossings between Jordan and Israel/Palestine. 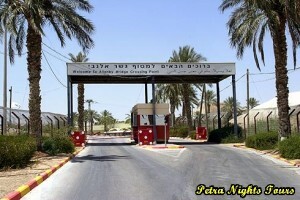 The Allenby Bridge connects with the West Bank and this side is controlled by Israeli authorities. Just as note, Israeli citizens are not allowed to use the bridge. The crossing is open every day, closed on Yom Kippur (Day of Atonement) and Eid Al Adha (Muslim Feast of Sacrifice) only. For the Jordan side applies: from Sunday to Thursday you have to be latest at 18:00, on Fridays and Saturdays latest at 10:30 am at the border. However, the opening hours are not guaranteed as sometimes the border closes earlier without notice. Especially if you plan to arrive in the afternoon it is to recommend to check the opening time with the authorities (Tel: 00962 5 358 1030). Passenger procedure includes in both terminals a security check, payment of the departure tax, passport control, customs and to board the shuttle bus, operating between the terminals. Usually the shuttle bus leaves every hour, sometimes more irregular, so be prepared for waiting time. The shuttle bus from the Jordan terminal costs 3 JOD per person and 1.25 JOD per luggage. The Jordanian departure is 10 JOD (circa 14 USD) per person and the departure tax at the Israeli terminal is NIS 167 (ca 52 USD) per person. The taxes are paid in local currency, and you can find exchange shops in both terminals. The Allenby/King Hussein Bridge offers a faster VIP service, which is about 100 USD per person. Because several countries refuse the entry if the passport shows an Israeli stamp, it is possible to avoid the stamp as follows: just ask already on the Jordan side not to stamp your passport, as it is known, the Allenby Bridge is the crossing between Jordan and Palestine/Israel. Inside the Israeli terminal you do the same. You have to fill a form and together with your passport hand it over to the immigration officer, who will stamp the form instead. Important note for visitors arriving Jordan via the Allenby Bridge: it is not possible to obtain the Jordanian visa at the Allenby Bridge, so you need it in advance from your country of residence. In general, be prepared for waiting time in the Israeli terminal due to the security checks, and in some cases to be questioned by the immigration officers for the purpose of your visit. We are thankful for any advice from travelers who recently used this crossing.